Conquer your fears, the Dragon Worriers are here! 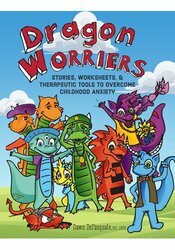 As each dragon’s anxiety story is told, children are guided through solutions and strategies for the dragon, which helps develop their skills for dealing with their own anxiety. Worksheets, logs and illustrations are included. Included in each chapter is a section just for caregivers and professionals, giving clear steps to help children overcome their worries. As a bonus, there are treatment plans and case studies to help demonstrate techniques that are most effective in solving even the worst anxiety issues. Dawn DePasquale, MA, LMHC has over fifteen years experience treating children and their families for a variety of mental health disorders. She has trained mental health professionals all over the U.S. on the treatment of anxiety disorders in children.